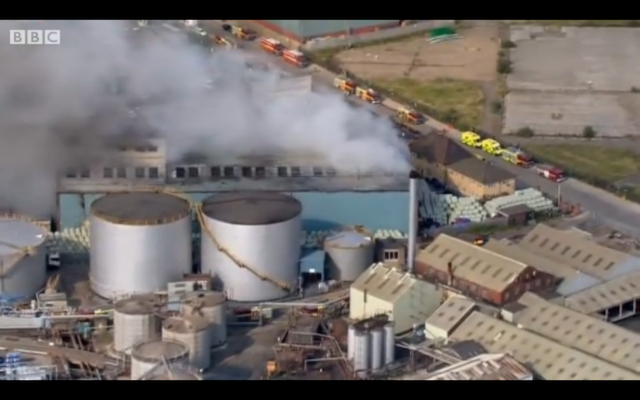 A blaze described by London Fire Brigade as one of the biggest in the capital for years has damaged a Dagenham recycling facility. Over 200 fighters and 40 engines tackled the blaze, which broke out around 1.15pm at Hunt's Waste recycling centre on Chequers Lane. It's thought that nobody was injured in the conflagration, which is now under control. At its height, the smoke cloud could be seen from the Olympic Park six miles away. London Fire Commissioner Ron Dobson told the BBC: "We've not seen a fire of this size in London for several years — it's certainly a dramatic end to the Olympics for the London Fire Brigade". The BBC has further reporting.